This page is about "Terracotta Tile" which is machine made and high temperature fired. Mexican Saltillo tile is on another page and is hand made and low temperature fired. Approximately 3/4 inch thick with colors in the orange/beige/peach range. Many of this type tile is imported from France, Brazil, and other countries. These tile have had a tendency to stain quite easily during installation. Caution must be taken to not walk on unsealed tile. We have seen permanent stains from an installers shoe and a plain water drop. Fortunately, Aldon color enhancing sealers tend to disguise this. In this case, test "Grout Easy" to make sure it will work for you before grouting the project. Traditional old world beauty from smooth to rustic | Creates a rich, soft feeling | Many choices for sealer finish gloss level - from none to high gloss | The right sealer can also make it durable. These tile are generally in the medium to high absorption range and will stain immediately unless sealed. A Mexican Tile is a type of terra cotta (terracotta) tile, however, it has its own unique characteristics that requires another special page. You might want to review that page also. This page is specific for the non-Mexico made terra cotta tile (from Brazil, France, etc.) and these have different and unique requirements. See below for ways to identify these "terracotta" tile from "Mexican" tile. If your tile has been sealed by the supplier - it is a different tile. See the Factory Sealed Surfaces page instead. * Test first to confirm there is not a staining issue with Terracotta Tile. 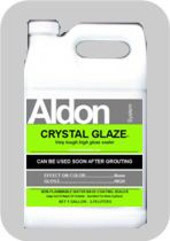 ** Should not be needed after using Grout Easy. *** The color enhancing effect will require treatment to the entire area, not spot treating. #2. If the Terracotta Tile is grouted, but never sealed. ** If you have white powder (efflorescence) stains. The color enhancing effect will require treatment to the entire area, not spot treating. #3. If the Terracotta Tile has had a sealer applied in the past. "Same Day Sealer" on Terracotta Tile. This sealer is Water Base | Penetrating Type. Provides: No color enhancement or gloss. Coverage guidelines (depending on absorption) 250 to 600 sq.ft./gal. 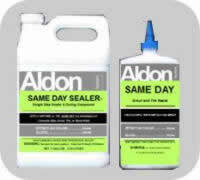 Same Day Sealer is the one when you want to protect the tile, but do not want any change to color or gloss. "Crystal Glaze Sealer" on Terracotta Tile. This sealer is | Water Based | Coating Type. Provides: little or no color enhancement and high gloss. Coverage guidelines (depending on absorption) 350 to 600 sq.ft./gal. Crystal Glaze will create a small amount of color enhancement and a high gloss. 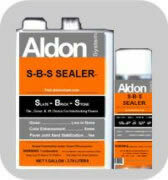 "S-B-S Sealer" on Terracotta Tile. This sealer is | Solvent Base | Penetrating Type. Provides: color enhancement | low gloss | strengthening | efflorescence barrier. Coverage guidelines (depending on absorption) 150 to 500 sq.ft./gal. S-B-S Sealer will create some color enhancement and no gloss with one application. Additional applications will build gloss to a matte level. Add one application of "Lifeguard" for one higher level gloss. You can increase gloss with more applications as desired. Showing "Porous Stone Sealer" on Terracotta Tile. This sealer is | Solvent Base | Penetrating Type. Provides: color enhancement | medium-high gloss | strengthening | efflorescence barrier. Coverage guidelines (depending on absorption) 150 to 400 sq.ft./gal. 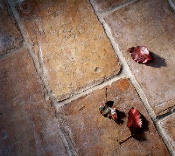 Porous Stone Sealer will provide more color enhancement and a matte-medium level of gloss with one application. Additional applications will increase the gloss. This higher solids level sealer will take fewer gallons to create the desired gloss level than S-B-S Sealer. 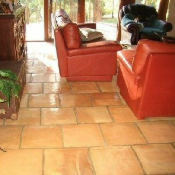 Easy Care Products: for a Terracotta Tile floor. "Maintain" - for no streak wet mopping of Terracotta Tile and all other types of flooring. You may have heard of concerns about Terracotta Tile. All of them would be prevented with the information we provide here. Therefore, you can have the floor you want!